Motto: Quis Separabit - "Who Shall Separate Us"
If you are planning or thinking about leaving the Irish Guards or have already have done so, then contact us today and we can give you advice and contact employers suitable for your skills and experience. Let us help you take the first steps to a new career. The Irish Guards (IG) as they are today were formed on the 1st of April 1900, but this regiment is the second unit to have used this name. The first was the Irish Guards who fought on the side of the Jacobites at the Battle of the Boyne and went to France to join the Stuart Regiment in the year 1692. A French Army regiment called the 92e Régiment d'Infanterie can state that its ancestry can be traced back to this such unit. The regiment now part of the Household Division was created by order of Queen Victoria and was brought about as a honour to the soldier who were involved in the conflict in South Africa known as the Boer War. 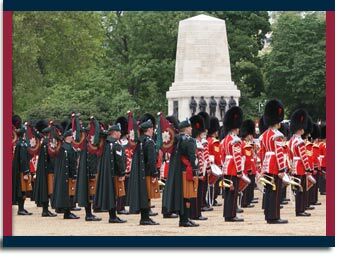 For the initial 14 years of service the Irish Guards station only in the UK and performing ceremonial duties in London. The First World War broke out and the Irish Guards were called to action, they fought gallantly in battles such as The Somme and Third Battle of Ypres. Thee Irish Guards again were asked to bear arms in the Second World War and were part of the ground force in Operation Market Garden. The regiment missed the Falklands War, but saw action in the Balkans and 2nd Gulf War. More recently the Irish Guards have been deployed to the conflict in Afghanistan. With the army reforms of 2004 the Irish Guards stayed a single battalion regiment, but with a set role, light infantry. They have alternating public duties with the Coldstream Guards at Windsor Castle.